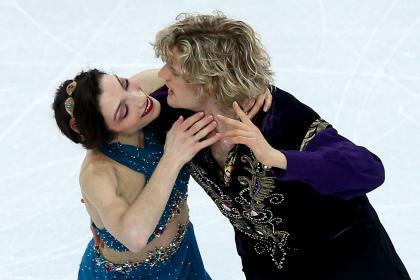 SOCHI – For years, Charlie White has dated the "hottest athlete" of the Winter Olympics – but he doesn't want anyone to know about it. White, who along with Meryl Davis is favorite to win ice dance gold at these Winter Olympics, is in a long-term relationship with model and former figure skater Tanith Belbin, who was voted by Men's Health magazine as the most attractive female Olympian at the Vancouver Games four years ago. However, while most men would surely want to tell the world if they were lucky enough to be in his situation, White admitted that he tries to keep his off-ice partnership with Belbin a secret, for competitive reasons. When asked by Yahoo Sports recently about the fact that during the last Olympics his relationship with Belbin was kept on the "down low," White said: "It actually still is. So probably ... we don't really talk about it. As an ice dancer, we take our on-ice relationships so seriously, and that's really the way we like to go about it. [Davis and I] are just presenting ourselves as a team, and all the rest of that [with Belbin] can wait for later." 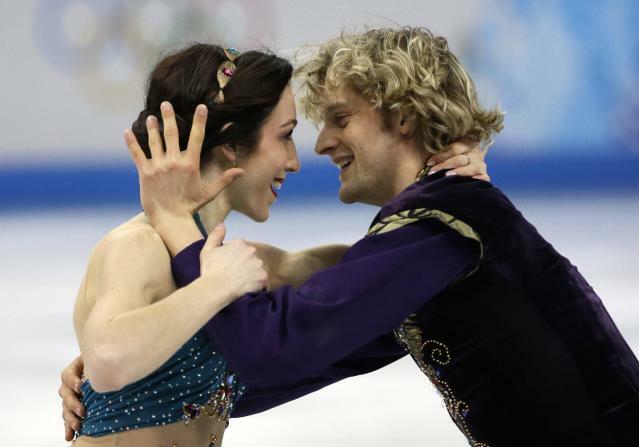 Davis and White have been ice dancing's top team over the past two seasons and won Olympic silver four years ago. As part of their routine, they often portray characters that are in love, with as much realism as possible for the benefit of fans and judges. Belbin is a former ice dancer who competed for the United States with Ben Agosto, winning a silver medal in Torino in 2006 and placing fourth four years later. Along with Davis, White will battle Tessa Virtue and Scott Moir of Canada, their close friends and training partners, when the individual dance event begins on Sunday. Asked if it is an odd feeling to portray being in love with a woman other than his girlfriend, White said, "It's just sort of the way we all fall in." "Because we've been doing it for so long it just seems so natural," White added. "Meryl and I have been skating together for 16 years. We've known each other for our whole lives. It just feels really natural that that's how we sort of present ourselves to the world that cares about us as skaters." Do they deliberately present themselves as a couple? "Exactly," said Davis. "Obviously we get a lot of questions about whether the two of us are dating, and that's a good thing, because that means we're doing our job out on the ice. Meryl and I are oftentimes trying to portray people who are in love. We've always been great friends, and we have a special relationship, but we've never been romantically involved." The relationship between Belbin and White was widely known in the figure skating community since before the Vancouver Olympics, but it has generally escaped public attention. Both Belbin and White have generally remained tight-lipped on their love life and rarely mention each other on social media, with little in the way of public displays of affection since this tweet from Belbin back in 2011. My bed, my dog, my @CharlieaWhite :) Life is good. So happy to be home! Dan Patrick asked Belbin about her relationship with White on NBC last weekend, asking if it conflicted with her new role as an analyst and interviewer for the network. "I do have an objective eye," she said, "to a certain degree of course. I'm also nervous watching them skate. I want them to succeed." White was captain of the U.S. squad that finished third in the team competition that finished on Sunday. His free dance with Davis landed their highest-ever score in international competition. The U.S. has never won a gold medal in ice dance, which was introduced into the Olympic program in 1976. A report surfaced in a French newspaper over the weekend alleging that a deal had been struck between Russian and American judges to give Davis and White the dance gold, in exchange for favorable scoring for the Russians in the team event. Those accusations were firmly rebuffed by all parties, and, frankly, if Davis and White maintain their current form, they have no need for a "fix" anyways. Davis and White currently study at the University of Michigan in Ann Arbor, and White admitted there would be tough decision to be made about his future after Sochi. One choice is to carry on until the next Games in Pyeongchang, South Korea, in 2018. The other is for him to walk away from the ice and presumably be able to celebrate his personal relationship without feeling the need to keep it hidden from the public.